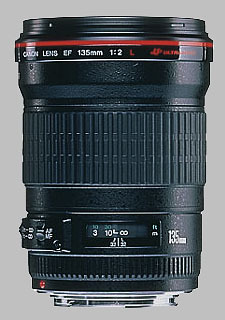 (From Canon lens literature) The fastest 135mm telephoto lens in its class. Ideal for indoor sports and portraits with background blur. Two UD-glass elements correct secondary spectrum for outstanding sharpness and color. As you'd expect from a premium prime lens, both maximum and average chromatic aberration is very low across the aperture range, with the maximum CA on the order of 0.02% of frame height regardless of aperture. Exposure uniformity (vignetting) is also really excellent, reaching a maximum of 1/4 EV (on a camera with an APS-C size sensor) at f/2, and dropping to well under 1/10 EV at f/2.8 and above. The lens shows a very slight pincushion distortion, but it's well under 0.1% of frame height, an excellent performance by any measure. Finally, although we don't explicitly test for it, we have to note that this lens' bokeh (rendering of out-of-focus objects) is really excellent as well. Fit and finish are first-rate as well, with very smooth manual focus operation, and very fast autofocus on the camera. Bottom line, this is just an outstanding lens by any measure, one that makes clear why you'd want to pay the freight for expensive prime glass. - Actually though, it's performance is so good that you really have to consider it a bargain, even at the $800-900 street price. It just doesn't get any better than this! The Canon 135mm f/2 is no less impressive on a full-frame camera. Testing on an EOS-5D, we see that it's sharpness is almost as good wide open in the corners as on the EOS-20D with its smaller sensor. At the other end of the aperture range though, the 5D's larger pixels actually help matters, as the softening starts later (it's very sharp even at f/16), and is noticeably lower at f/32. The 5D's larger pixels also make chromatic aberration somewhat lower at most apertures. As you'd expect though, distortion and light falloff are both higher with a full-frame image circle, but perhaps not as much as you'd normally expect. Light falloff (vignetting) gets pretty high (0.73 EV wide open, but drops to 0.3 EV at f/2.8, and only 0.17 EV at f/4. Geometric distortion is lower than one would expect, at 0.15% pincushion maximum, with an average of 0.07%. We always expect to see some drop in performance (particularly corner sharpness) when we move from testing on a sub-frame to a full-frame camera, but the 135mm f/2L turned in a really remarkable performance even at full-frame. Really, just an amazing lens, easily worth the $800-900 it commands on the street. No weather sealing, makes all my other lenses look poor (even the 'L' zooms that, when I first got them, imagined could hardly be improved on). SIx months on from buying it this has become my favourite lens ever, beating my previous favourite (Leica's 4th version of the 35mm Summicron for its M-series rangefinders). I use it for everything, landscapes, townscapes, interesting detail, portraits. It is harder work than using a zoom lens, and some shots I just cannot get at all (cannot get close enough, or far enough way) but the shots I do get are so much nicer looking than I get with any other lens that for me and my goals it is a fair trade off. Some reviewers have listed lack of IS as a "Con". I disagree. IS is useful in my f/4 zooms but I don't need it to hand-hold this lens. The combination of a wide aperture and very little light lost in transmission makes very high shutter speeds possible. Besides, adding IS would mean adding extra elements and that would very likely reduce the image quality. Images that sing. Sharp wide open, wonderful bokeh, fast AF in dark conditions. Minor purple & green fringing wide open. My copy is 12-years-old and still delivers at over 75 weddings a year. Magical images, great AF, great close focusing abilities. Many lenses lose their appeal after time, but not this one. Deserves to be in the camera hall of fame. I shoot it wide open 90% of the time. In the highest contrast situations there's a hint of both purple and green fringing but both are minor and easy to remove with software. I owned this lens for a long time, then traded it for the 70-200 2.8IS II. I liked the extra versatility of the zoom and the ability to shoot at 200mm. Well, after lugging that lens around for years, I'm experimenting with adding the 135L back to my kit. The 135L is half the weight of the 70-200 2.8IS. This is huge for me, as it allows me to be much more nimble with getting the right composition and angle. I found with the 70-200 made me lazy. Due to the weight, at times I didn't move my shooting position and just zoomed to a composition that worked. This lens is very sharp, corner to corner wide open. It improves slightly stopped down. Focal length is great. I thought I would miss shooting at 200mm, but 135mm is long enough for most portraits and gives a decent amount of compression. F2 allows higher shutter speeds in lower light without raising the ISO. I just wish this lens had IS for low light and portraits with flash. With the high megapixel cameras, most people are going to ideally want to shoot at 1/200 or faster. You can go lower, but you have to watch your technique. IS would also help outside with wind. Besides lack of IS, the only major issue I have with this lens is flare. It could really use an update to its coatings. This lens flares easily and the flare can be especially ugly if a sun or flash are in the frame. Overall, spectacular lens. Could use a few updates. I love this lens. Super sharp and renders beautiful creamy bokeh. It's bokeh is comparable to the 85mm 1.2 but IMO not as nice. It also focuses really fast and accurate and is light. I mainly use for head shot photography. I have done a review comparing the sharpness and quality of bokeh to the Canon 70-200 2.8. After reading too many long, and arduous threads pertaining to the new Zeiss 135, I felt compelled to share my perspective on the wonderful Canon 135. For my purposes, this is a spectacular lens. I need fast auto-focus, predictable focus lock and natural, vibrant color rendition. This lens provides all of these requirements. Do I wish it were manufactured with metal? Sure, that would be swell...but it doesn't matter with regard to how it performs. I rarely shoot static landscapes or posed, composed images. For that I would investigate alternatives just to make sure. My work requires auto-focus. I do not use burst mode, but the lens would produce movie-like frames. In fact, it might be fun to try! On a full frame body, I rely upon this lens and it does not disappoint. If you shoot things in motion on a Canon body, and need some reach without massive bulk, this is the one I recommend. This is one of the sharpest lens i've ever owned. It's not the most versatile lens, but it's very great for tight portrait shoots; background blur is creamy IMO; one of the best 'bokeh' lens. Image quality is great, it is tack-sharp wide-open even though for partraiture, a little bit of softness is needed. Built quality is wonderful, focus ring is well-damped. The only reason i sell this lens is because of versatility. I mount it on my APS-C camera and the focal length literally becomes 216 mm, which is too tight. Otherwise, on FF body this lens is wonderful. f/2, fast-accurate-silent focus, (relatively) small & light, super sharp!! I wish every lens was this good!! I just love the lightning fast & accurate focus of this lens. It focuses within a blink of an eye, instantly. Focus are dead on with my Fullframe or APS system. It's an ideal portrait lens. Bokeh is buttery smooth, best you can get from a 135mm. I prefer this lens than the 70-200/2.8. This lens is simply lighter, cheaper & faster (f/2.0 vs f/2.8). If canon puts an IS on this lens, it would be perfect! One of my very best lenses! Sharp, handy, strong colours and contrast. Perfect lens on the same level as CZ! If You can afford it, buy it! You will see why. If You can not, buy Canon EF 85/1.8, which delivers quite similar results. Definetely the most sharpest lens which I have ever seen. Trully sharp accross whole frame from f2 on 5d. Amazing colours, contrast, bokeh, everything! Typical L construction. Large focus ring. Has a good weight to it. Not heavy like the white tele-zooms. Crazy fast AF! AF ring feels loose compared to my other L lenses. Large hood. I got this lens because of portraiture. It is fantastic on my old 5d. Creamy smooth bokeh. Tack sharp even at wide open aperture. One thing I am most stun is its AF performance. I've owned a few L lenses and while their USM motors have always been quick to snap in focus, this 135mm is on a different level. From far to near, the AF is instantaneous. Colour and contrast is great. Really like the large focusing ring. I'm not a fan of the large hood. But will live with it as it provides good protection of the front element. best lens, blur, sharp-super, no CA, minimal shading. This is one of my all time favourites. Already wide open this lens produce some high quality photos. Sharpness, contrast and the natural vignetting on full-frame cameras is awesome! Some people may disagree with the vignetting being a good thing or not, but thats a matter of taste I guess. I have found myself shooting wide open almost all the time. Because it manage to do so. Yes, there is some sharpness added when stopping down to f4 or f5.6 but after that it doesn't get better. This leaves you with a buttery bokeh and an object in perfect focus. On FF I use this lens for both tight portraits and landscape shots. Its a joy to work with every time. Only con I can think of, and that may be a big one depending on how you plan to use the lens is the lack of weather sealing. No rubber sealing against the camera body tend to give me the creeps when shooting in the wet. Perhaps it's not a big thing, but for a L-graded lens this feature should be expected. My favourite lens, hands down. USM works so quickly and accurately, it puts my 24-70/f2.8L to shame. Great reach for street shots. A tiny bit of fringing, but that would only be noticed by pixel-peepers. Great looking lens, if you ever saw it from the front. One of the best and sharpest lens around. Great for portraits. i have never been a prime lens fan, just seems to leave you feeling trapped in a single dimension. But this lens changed my mind. I use it to photograph highschool basketball in poor light. You will never be able to beat this lense, believe me, i have tried them all. It is by far the fastest focusing, best bokeh, and lowest light lens you will ever find. Wonderful, smooth bokeh. Sharp without being harsh. Contrasty, saturated, nice colours. Fast. I bought it for its bokeh. The background blur is amazingly creamy with this lens. It is sharp but somehow not that analytic way as a macro lens. That's why I really enjoy shooting portraits with it. Sharp but smooth at the same time. Smooth but contrasty. Contrasty but not harsh. Well saturated but neutral. Neutral yet very nice colours. Best lens for portraiture I've ever tried. AF is accurate and very fast. Build quality: excellent. CAs: a little in the OOF area - not disturbing anyway. (on a full frame camera)Wonderful lens for some portraiture applications, sporting events and candids at a party or event. It is the lens I use as a reference point to compare all new lens acquisitions to after purchase to determine if they need to be returned for repair or replacement. The lens is so crisp that the diaphragm blade pattern is visible on point light sources shot at large aperature. Excellent color and saturation, a virtually perfect lens. Fast focus, Super sharp, Well built, Awesome for low light. Not too heavy. One of Canon's best lenses for a reasonable price. Its a no brainer if you use this focal length. Really excels as indoor sports lens on a crop camera. This lens is one of canons finest lenses i have ever used. the lens is built strong, very strong. when you hold the lens in your hand you know you are holding a fine peice of optical equipment. image quality wise it is by far one the sharpest lenses ive ever used. There is no doubt that the 135L deserves it excellent reputation for image quality. My 24-70L needs to be stopped down to f5.6 to begin to match the sharpness of my 135L at f2.0 (the test shots were of the portrait of Andrew Jackson on a $20 bill). However, when my Canon "L" lenses are used at f8 they are all very sharp and the 135L does not blow the others away. My only complaint about this lens is that the depth of the lens shade forces me to remove the shade in order to remove or replace the lens cap (my hands are fairly large). This is so annoying that I intend to replace the Canon lens cap with a Tamron cap. Still, all things considered, I prize this lens very highly and can not imagine giving it up. 1. Lens hood - when I bought this lens years ago the included hood was rather cheap (perhaps Canon has updated the hood) by comparison with other hoods. Just plain black plastic (no interior felt as in newer lens hoods). Plus it is harder to attach than other lens hoods. 2. No rear seals - since the 17-40 Canon has added rear seals to L lenses, to help in weather sealing. On the 135/2 all you've got is the bare metal. So there - it is not a perfect object. The Precious - sharp images, fast focus, perfect weight, reference-quality build. At under 900USD, it's a steal. I've owned nice SLR gear since 1976, and am normally a wide angle shooter ... this is my favorite lens, of all time. How's that for an endorsement? Super Sharp.Super Fast AF. Big F-value.Light. This is an amazing lens.Very sharp wide open and no improvement when stopped own. Excellent build quality, fast auto focus, and its fast. But for me, the reason to get this lens is the Bokeh and DOF control. Be careful with the focus. I've missed shots at wide apertures because the DOF is so extremely thin. At around $900 US very good price for quality... no IS. It is so sharp it makes you rethink the use of your zoom lenses. This is a stunning lens, clearly one of the very best lenses that Canon produces, this is in the same world class as the 35 1.4, 85 1.2 L lenses. At $900 US it a relative steal. In photoshop I love to zoom 200, 300 and even 400% to see the extreme details it is an absolutely amazing lens, great backround blur, great for low light weddings with available light. Amazing for portraits, easily fast enough for indoor sports. With this lens you don't need to do much if any post processing. If you can afford it buy this lens, you will love it. The only thing that could possibly make this better would be to add IS. A con is that it really makes you rethink the use of your zoom lenses. Oh yes, and it leads to lusting after other primes!